This post is for the Australian part of my family, who will be rest assured that they’ll be able to eat yummy gluten-free fare when they come to Paris. When you think French cuisine, you probably picture three important ingredients: butter, white flour and meat or fish. While I’m the first to jump on a chocolate croissant, a baguette fresh out of the oven, or a buttery sole meunière, I must say that this is only a part of modern French cuisine. Traditionally, it’s been a challenge to be vegetarian or gluten-free in France. This is all changing. Decent vegetarian, vegan and gluten-free options are becoming more and more popular, and a whole new kind of restaurant is opening in Paris. Those of us in search of dishes staring fresh seasonal vegetables, alternative grains and innovative desserts can rejoice. 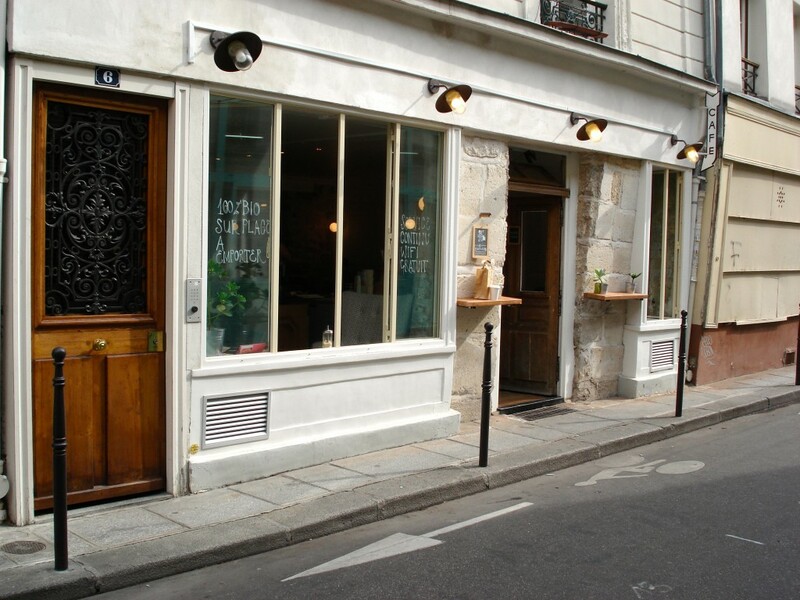 Café Pinson (6 rue du Forez, Paris 3e) is a special find, tucked on a small street in the northern part of the Marais. Cheerful waiters (who are quite accommodating with babies and strollers), small bistro tables, oversized armchairs, and eye-appealing goodies – that’s what awaited me as I ventured into this casual restaurant for lunch with a friend the other day. I was immediately pleased with the array of vegetarian/vegan options and then with how fresh the ingredients were. I enjoyed a grated carrot salad with four different spices, then chickpea galettes with green beans and plums, and a gluten-free café gourmand for dessert. The menu changes daily, so chances of you having the exact same combo are slim. I like the idea of being continually surprised though, and knowing (as someone who doesn’t eat meat) that I’ll be able to choose from anything on the chalkboard. I could only find two small problems with Café Pinson: you can’t work the baby changing table with only one hand (you need two to put it back in place), and it was hard to choose from all the vegan and/or gluten-free desserts (everything looked good). I’ll be going back, even if it’s just to try the raw cacao délice I eyed at the counter; the waiter explained it was made of pure, unprocessed chocolate and was so intense that we could probably split it four ways – perfect for when my three nieces come to visit. Did I convince you to make the 24-hour flight? P.S. You can order take-out at Café Pinson, or enjoy brunch on the weekends. 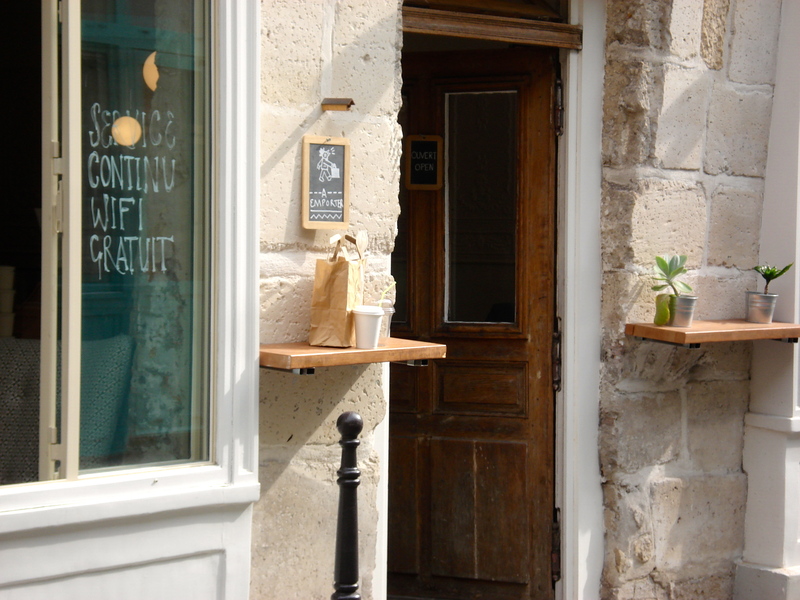 This entry was posted in French Cuisine Today?, Healthy Living, Restaurant Reviews and tagged brunch, chocolate, restaurants, travel, vegetables. Bookmark the permalink. you are the next big trip for us. Miss you!!! From Paris to Bordeaux, your trip’s already planned for you! I am counting the dates as to when I will go try all this wonderful food. What a wonderful discovery.